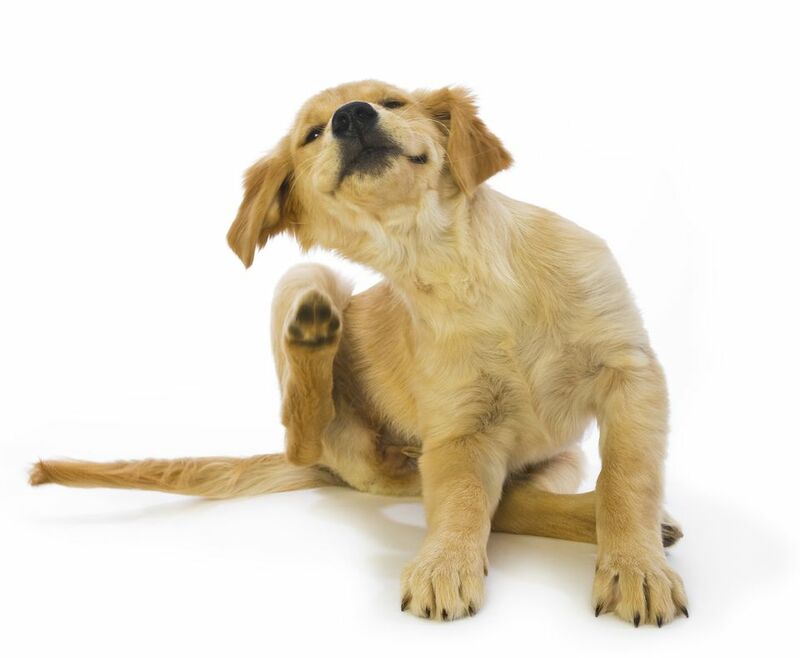 Frequently Asked Question: How Can I Help My Itchy Dog? Perhaps this sounds familiar to you: Your dog has itchy skin and scratches most of the time. You have tried home remedies, baths, and over-the-counter flea medication. You are concerned about your dog's comfort. You are also frustrated by the constant licking, chewing, and scratching. It may even be keeping you up at night. You are at your wits end! What can you do to give your dog some relief and yourself some peace of mind? Skin problems in dogs are all too common, and it is so difficult to watch our canine companions suffer. The best thing you can do is to talk to your veterinarian about your dog's health conditions. Meanwhile, here are some suggestions to help you manage your dog's skin issues. Flea control is a year-round MUST for dogs with itchy skin. Even if fleas are not the main cause of the skin issues, just a few flea bites can cause the skin to get out of control. There are many flea control products on the market and new ones a coming out all of the time. Be aware that flea product efficacy may decrease over time as fleas develop resistance to the products. Your vet's office is usually the best source of effective flea products. Some over-the-counter products are simply a waste of time and money. Look for a flea preventive that starts killing fleas within 30 minutes and can kill all fleas within a few hours. Oral flea preventives tend to work in this manner, though they do require the flea to bite before it can be killed. With topical flea prevention, the fleas may not even need to bite your dog in order to be killed. However, topicals usually take longer to begin killing after applied, which means there is a longer window for the live fleas to bite before the product starts working. Some topicals may also not last as long as oral flea preventives depending on your dog's environment. Baths and swimming can make topical products wear off faster. Not all of the best flea preventives work against ticks. You may need a separate product for ticks. Ask your veterinarian for help finding the best flea and tick products for your dog. No matter what you choose, be sure to use it regularly and as directed all year long. The bottom line: Different dogs react differently to products, so you may need to try a few and see how it goes. Diet plays a major role in the condition of your dog's skin. It is important to feed a high-quality diet You may even consider a quality natural/holistic food to see if it helps. Supporters of natural supplements (many vets included) recommend adding fish oil and/or omega 3 fatty acids to the diet. If you are already feeding a diet like this, consider changing to one of equal quality. Give it a few weeks and watch. If your dog is still itchy, you may need to try a hypoallergenic diet or limited ingredient diet. Ask your veterinarian for diet recommendations. Food allergies account for a very large percentage of skin issues in dogs. If you decide to a limited ingredient diet trial, be sure to choose a novel protein (one your dog had not been exposed to, possible duck, fish, etc.) and feed ONLY that diet for 6-8 weeks. Frequent bathing is VERY important for dogs with skin issues. For dogs with seasonal allergies, consider bathing once a week when skin issues flare up. For a natural option, try a soothing shampoo that contains oatmeal and/or aloe. If it does not help, ask your vet to bring out the big guns. There are many medicated shampoos that help soothe itchy skin and fend off secondary skin infections. There are lots of other great topical products, including cortisone conditioner for the itchiest of dogs. Itchy skin may be a sign of underlying skin infection or other medical issues. Don't let itchy skin get out of control! If you notice hair loss, redness, sores, scaly skin, or if the skin simply won't stop itching, make an appointment to see your veterinarian as soon as you can. There may be medications and other treatments that only your vet can help you with. Modern medicine has provided veterinarians with some excellent options to help itchy pets. Many of the newer products are safer and more effective than older medications.